If It’s Got A Gear We Have It! We carry parts for all makes and models of transmissions, differentials, transfer cases and PTOs as well as bearing kits, rebuild kits, seal kits, gears, yokes, shafts, splines, housings and cases. We carry rebuilt, new and used transmission parts for big rigs, trucks and equipment. Our experienced staff can also help you with other transmission-related questions. Buy new and used OEM heavy-duty truck transmission parts for Fuller, Eaton, Rockwell Meritor, Spicer, Mack and ZF. Visit our webstore and view our parts for your transmission and save even more. Parts for all makes and models of transmissions. Seal kits, rebuild kits, ring and pinion sets, bearings, spindles, splines, shafts, if it uses a gear we have it in stock! Same day shipping anywhere in the world on transmissions for trucks, tractors, heavy equipment and semis as well as replacement parts. We have all makes and models for your transmission needs. All models in stock and ready to ship Worldwide. One call does it all. International shipping, same day service. All models in stock ready to ship worldwide. One call does it all. We carry every transfer case part for all makes and models; as well as bearing kits, rebuild kits, seal kits, gears, yokes, shafts, splines, housings, cases. Same day shipping anywhere in the world on all parts for tractors, heavy equipment, semis and trucks. We have all makes and models for your vehicle repair needs. Transfer cases, drive axle, ring and pinion, crown wheel and pinion, in stock and ready to ship today, available for the following brands: Spicer, Eaton, Rockwell, Meritor, Mack, Dana, Fabco, Marmon Herrington, International, Volvo, GM, Dodge, Jeep, Isuzu, Oshkosh, FWD, Timken and Clark. Visit our web store to view transfer cases, replacement parts and accessories for sale. If you don’t find what you’re looking for or need assistance, contact us or call us Monday through Friday 8AM to 5PM EST at 877-776-4600 or 407-872-1901. We sell everything needed for your differential. With a full line of new genuine OEM and aftermarket parts including differentials, transfer case and transmission parts for Eaton, Fuller, Dana, Spicer, Roadranger, Rockwell, Mack, ZF, and Meritor, we get you back up and running in no time. We offer same day shipping, world-wide. Contact us today get your differential parts tomorrow 877-776-4600 or 407-872-1901! 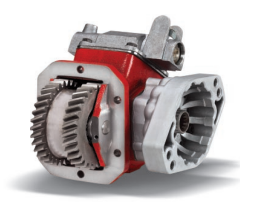 Pinion Drive Gear: Transfers power from the driveshaft to the ring gear. Ring Gear: Transfers power to the Differential case assembly. Side/Spider Gears: Help both wheels to turn independently when turning. Differential Case Assembly: Holds the ring gear and other components that drive the rear axle. Axle Housing: Metal body that encloses and supports parts of the rear axle assembly. 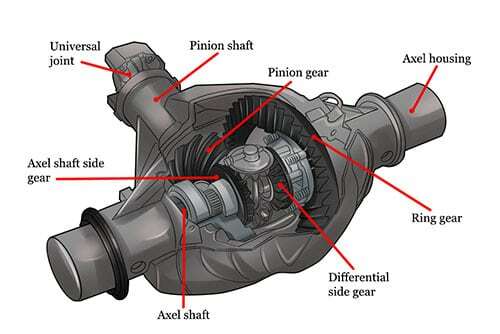 Rear Axle Bearings: Ball or roller bearings that fit between the axles and the inside of the axle housing. Rear Drive Axles: Steel shafts that transfer torque from the differential assembly to the drive wheels. We stock Eaton, Fuller, Rockwell, Meritor, Spicer (Dana or TTC), Mack, Chelsea PTO and ZF parts. We carry International truck parts, Ford parts, Western Star products, Freightliner truck parts and accessories, Kenworth parts and accessories and Peterbilt truck parts and accessories, including hard to find replacement parts for your transmission, differential, transfer case and PTO, ready to ship as soon as you call us: 877-776-4600 or 407-872-1901. We have a full parts warehouse, if you don’t see something, please give us a call and we will help you get the parts you need. We are your one stop for the complete Parker Chelsea line of PTO parts, Chelsea PTO parts manuals, parts catalogs and service manuals, Power Take Off units and accessories. We offer the complete line of Parker Chelsea PTOs for American, Japanese and European applications. Cast iron 6-bolt and 8-bolt units are all available. Several types: countershaft, split shaft, power shift and front mount applications as well as air, cable, lever, or electric shift PTO options include: over-speed controls, flanges and shafts for direct or remote mounting to hydraulic pumps, product pumps, and mechanical drive uses. We also stock Parker Chelsea Transmission PTO’s & parts for trucks such as Freightliner, Peterbilt, International, Mack, Kenworth, Ford, GM, Crane carrier, Isuzu, GMC, Oshkosh, Kalmar Ottawa, and Hino Trucks. When you purchase any of our truck PTO’s for sale, you get peace of mind on your purchase, with our Chelsea Parker PTO and pump warranty. For assistance call and speak to one of out PTO experts at 877-776-4600 or 407-872-1901. We sell all your PTO needs including; PTO units, parts and accessories. Visit our Chelsea PTO Manuals page to view our collection of PTO user manuals, parts manuals, owner manuals and more.